Errol Spence Jr. fought like a man who had been locked away and was ready to rip the head off a bull. 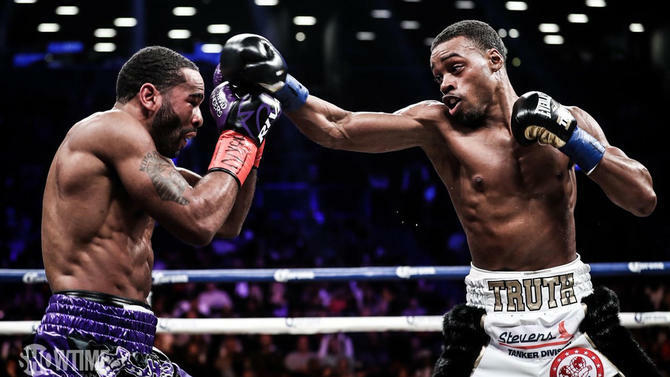 Already regarded as one of the top fighters in the world, Spence put on a scintillating performance and stopped former titlist Lamont Peterson in the eighth round to retain his welterweight world title for the first time Saturday before 12,107 at Barclays Center in Brooklyn, New York. Spence (23-0, 20 KO's), of DeSoto, Texas, a 2012 U.S. Olympian, who defeated Kell Brook in an impressive 11th-round knockout last May to earn the IBF title, connected with a left and a right in the fifth round, dropping Peterson to the canvas. Spence continued to attack and battered Peterson, whose right eye began to swell. Peterson, fighting on pure instinct, came back with two left-hand bombs, but Spence continued to land hard shots. In the fifth, Spence picked up right where he left off and hammered Peterson with lefts and rights. At the start of the seventh round, referee Harvey Dock called time for the ringside doctor to examine Peterson. Whether it was the sporadic left hand from Peterson or a break in the action, Spence, who turned 28 last week, continued to punish Peterson. However, referee Harvey Dock called a halt to the bout when Peterson's trainer Barry Hunter asked for it to be stopped. Peterson (35-3-1, 17 KO's), a Washington D.C. native, last fought at Barclays Center in April 2015 when he lost a very controversial decision to Danny Garcia. But tonight, the judges had an easy job, as Spence put on a thoroughly dazzling display. Peterson vacated the secondary welterweight world title he won from David Avanesyan on points in an impressive performance last February in order to get a shot at Spence.